In the years following the French and Indian War, the Parliament increasingly sought ways to alleviate the financial burden caused by the conflict. Assessing methods for raising funds, it was decided to levy new taxes on the American colonies with the goal of offsetting some of the cost for their defense. The first of these, the Sugar Act of 1764, was quickly met by outrage from colonial leaders who claimed "taxation without representation," as they had no members of Parliament to represent their interests. The following year, Parliament passed the Stamp Act which called for tax stamps to be placed on all paper goods sold in the colonies. The first attempt to apply a direct tax to the North American colonies, the Stamp Act was met with widespread protests. Across the colonies, new protest groups, known as the "Sons of Liberty" formed to fight the new tax. Uniting in the fall of 1765, colonial leaders appealed to Parliament stating that as they had no representation in Parliament, the tax was unconstitutional and against their rights as Englishmen. These efforts led to the Stamp Act's repeal in 1766, though Parliament quickly issued the Declaratory Act which stated that they retained the power to tax the colonies. Still seeking additional revenue, Parliament passed the Townshend Acts in June 1767. These placed indirect taxes on various commodities such as lead, paper, paint, glass, and tea. Again citing taxation without representation, the Massachusetts legislature sent a circular letter to their counterparts in the other colonies asking them to join in resisting the new taxes. In London, the Colonial Secretary, Lord Hillsborough, responded by directing colonial governor to dissolve their legislatures if they responded to the circular letter. Sent in April 1768, this directive also ordered the Massachusetts legislature to rescind the letter. In Boston, customs officials began to feel increasingly threatened which led their chief, Charles Paxton, to request a military presence in the city. Arriving in May, HMS Romney (50 guns) took up a station in the harbor and immediately angered Boston's citizens when it began impressing sailors and intercepting smugglers. Romney was joined that fall by four infantry regiments which were dispatched to the city by General Thomas Gage. While two were withdrawn the following year, the 14th and 29th Regiments of Foot remained in 1770. As military forces began to occupy Boston, colonial leaders organized boycotts of the taxed goods in an effort to resist the Townshend Acts. Tensions in Boston remained high in 1770 and worsened on February 22 when young Christopher Seider was killed by Ebenezer Richardson. A customs official, Richardson had randomly fired into a mob that had gathered outside his house hoping to make it disperse. Following a large funeral, arranged by Sons of Liberty leader Samuel Adams, Seider was interred at the Granary Burying Ground. His death, along with a burst of anti-British propaganda, badly inflamed the situation in the city and led many to seek confrontations with British soldiers. On the night of March 5, Edward Garrick, a young wigmaker's apprentice, accosted Captain Lieutenant John Goldfinch near the Custom House and claimed that the officer had not paid his debts. Having settled his account, Goldfinch ignored the taunt. This exchange was witnessed by Private Hugh White who was standing guard at the Custom House. Leaving his post, White exchanged insults with Garrick before striking him in the head with his musket. As Garrick fell, his friend, Bartholomew Broaders, took up the argument. With tempers rising, the two men created a scene and a crowd began to gather. In an effort to quiet the situation, local book merchant Henry Knox informed White that if he fired his weapon he would be killed. Withdrawing to safety of the Custom House stairs, White awaited aid. Nearby, Captain Thomas Preston received word of White's predicament from a runner. Gathering a small force, Preston departed for the Custom House. Pushing through the growing crowd, Preston reached White and directed his eight men to form a semi-circle near the steps. Approaching the British captain, Knox implored him to control his men and reiterated his earlier warning that if his men fired he would be killed. Understanding the delicate nature of the situation, Preston responded that he was aware of that fact. As Preston yelled at the crowd to disperse, he and his men were pelted with rocks, ice, and snow. Seeking to provoke a confrontation, many in the crowd repeatedly yelled "Fire!" Standing before his men, Preston was approached by Richard Palmes, a local innkeeper, who inquired if the soldiers' weapons were loaded. Preston confirmed that they were but also indicated that he was unlikely to order them to fire as he was standing in front of them. Shortly thereafter, Private Hugh Montgomery was hit with an object that caused him to fall and drop his musket. Angered, he recovered his weapon and yelled "Damn you, fire!" before shooting into the mob. After a brief pause, his compatriots began firing into the crowd though Preston had not given orders to do so. In the course of the firing, eleven were hit with three being killed instantly. These victims were James Caldwell, Samuel Gray, and runaway slave Crispus Attucks. Two of the wounded, Samuel Maverick and Patrick Carr, died later. In the wake of the firing, the crowd withdrew to the neighboring streets while elements of the 29th Foot moved to Preston's aid. Arriving on the scene, Acting Governor Thomas Hutchinson worked to restore order. Immediately beginning an investigation, Hutchison bowed to public pressure and directed that British troops be withdrawn to Castle Island. While the victims were laid to rest with great public fanfare, Preston and his men were arrested on March 27. Along with four locals, they were charged with murder. As tensions in the city remained dangerously high, Hutchinson worked to delay their trial until later in the year. Through the summer, a propaganda war was waged between the Patriots and Loyalists as each side tried to influence opinion abroad. Eager to build support for their cause, the colonial legislature endeavored to ensure that the accused received a fair trial. After several notable Loyalist attorneys refused to defend Preston and his men, the task was accepted by well-known Patriot lawyer John Adams. To assist in the defense, Adams selected Sons of Liberty leader Josiah Quincy II, with the organization's consent, and Loyalist Robert Auchmuty. They were opposed by Massachusetts Solicitor General Samuel Quincy and Robert Treat Paine. Tried separately from his men, Preston faced the court in October. After his defense team convinced the jury that he had not ordered his men to fire, he was acquitted. The following month, his men went to court. During the trial, Adams argued that if the soldiers were threatened by the mob, they had a legal right to defend themselves. He also pointed out that if they were provoked, but not threatened, the most they could be guilty of was manslaughter. Accepting his logic, the jury convicted Montgomery and Private Matthew Kilroy of manslaughter and acquitted the rest. Invoking the benefit of clergy, the two men were publically branded on the thumb rather than imprisoned. Following the trials, tension in Boston remained high. Ironically, on March 5, the same day as the massacre, Lord North introduced a bill in Parliament that called for a partial repeal of the Townshend Acts. With the situation in the colonies reaching a critical point, Parliament eliminated most aspects of the Townshend Acts in April 1770, but left a tax on tea. Despite this, conflict continued to brew. It would come to head in 1774 following the Tea Act and the Boston Tea Party. In the months after the latter, Parliament passed a series of punitive laws, dubbed the Intolerable Acts, which set the colonies and Britain firmly on the path to war. The American Revolution would begin on April 19, 1775, when to two sides first clashed at Lexington and Concord. 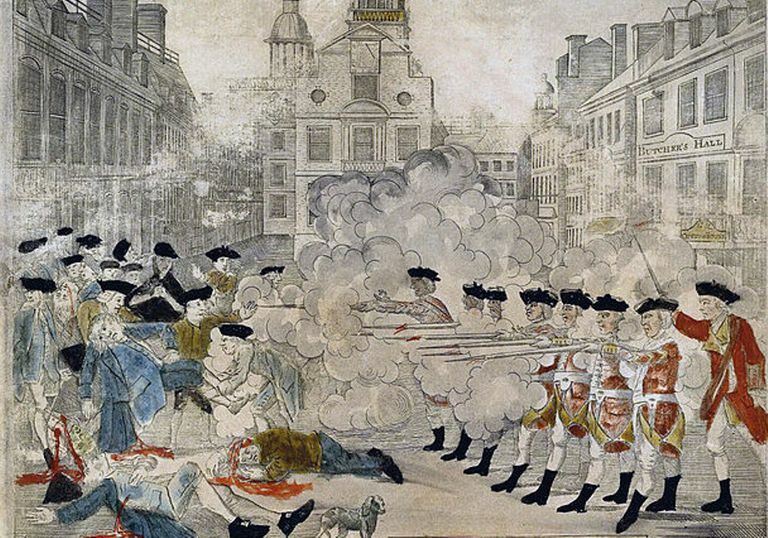 After the Boston Massacre, Why Did John Adams Defend Captain Preston?